I make strange New Year’s resolutions. This year I vowed to make my own bread for an entire year. No buying sandwich bread. That means even when I’m sick I’ve need to get my backside in the kitchen. That’s why I love the dough cycle on my bread machine. It does all the dirty work. All I have to do is take out the dough, shape it into a loaf, place it in a pan, and bake it in the oven. It looks like I’ve slaved away in the kitchen, a nice sort of deception. Like the old Rice Krispies Treat commercials where the mom pats flour on her face before serving her family cereal bars. This is especially helpful right now. I’ve got the flu and haven’t felt like cooking, or eating. I’m just doing the bare minimum to get by. There’s a full jar of peanut butter in the pantry. I think that qualifies as a meal. 1. Place all the ingredients in the bread machine pan except flours and yeast. Top the mixture with bread flour, white whole wheat flour, and top with the yeast. 2. Select the dough cycle. When finished brush a bread pan with butter and coat with flour. Set aside. 3. Knead the dough with your hands and shape into a loaf. Place the bread in the bread pan and cover with plastic wrap. Let rise in a warm place for 30 minutes. 4. Meanwhile preheat the oven to 350 degrees. After the dough has doubled in size, remove the plastic wrap and bake for 32 to 35 minutes until browned. 5. After baking, remove the bread from the pan onto a cooling rack. Brush the top with melted butter and cool completely. 1. To make sour milk, place 4 teaspoons of vinegar in a 2-cup liquid measuring cup. Add enough milk to measure 1 1/3 cups liquid. Set aside for 5 minutes before using. 2. Cheating is ok. Feel free to bake this bread on the whole wheat cycle if you’d prefer. Beautiful. The bread looks yummy. I can smell it cooking from here. Feel better... the flu how awful.. This bread will be making its way to my table soon, love the sound of it and the ease in making it, what a bonus. So sorry you're not well. You should give yourself the ok to break the resolution when you're sick, although the bread does look a whole lot better than store bought. Laura, I hope you're feeling better. Oh, poor thing! I hope you are feeling better. And bread with peanut butter is the perfect medicine! It's what I always eat when I'm sick. And homemade bread this yummy (love the list of ingredients) must indeed make you feel better. I am bookmarking this one!!! This sounds so comforting. And delicious. Wow, what a new year's resolution! I bet the family loved that one! I LOVE the bread dough cycle on my bread machine. Will give this recipe a try today!! I truly hope you are feeling better! Wow I'm impressed! I bet you're discovering some great bread recipes. I hope you get better! Yummy that sounds sooo good! I made tonight with some changes, and it turned out really wonderful! I used old-fashioned rolled oats, 3 cups all purpose flour, rapid-acting yeast, kneaded it by hand and only did a single one hour rise in the bread pan before baking. 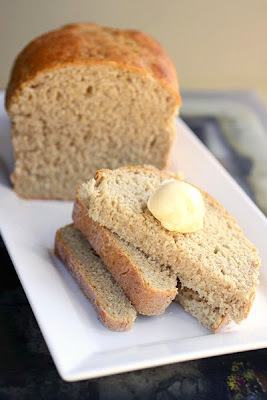 Thanks for this recipe--I love making homemade bread and needed to use up some buttermilk! Laura, Thanks for posting this recipe. I have made it twice now, and it's really a great bread. Also, thanks for the shooting and blogging tips. Every little bit helps, and I think your writing is great, hardly a weakness. I'm so glad you like this bread Kathleen and thank-you!